.i just signed up for my first marathon. 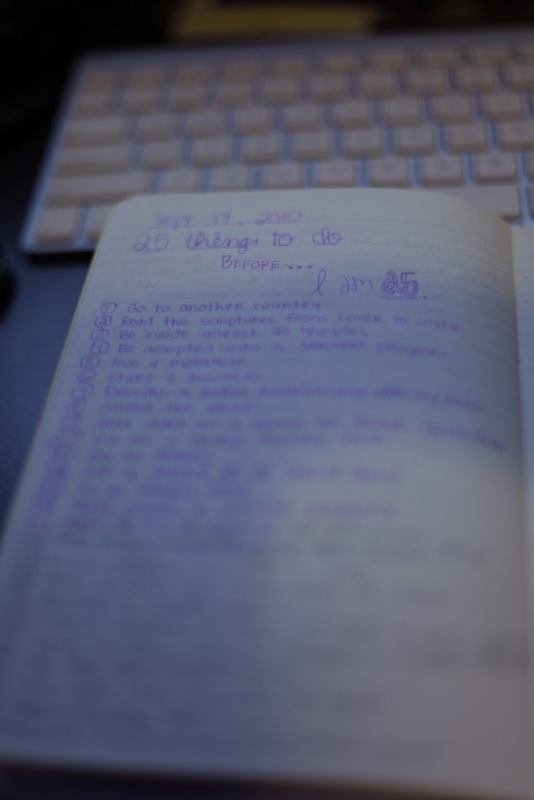 .on september 17, 2010 i finished a list of 25 things i wanted to do before i turned 25. .in just over a month i'll be 24 and have only one more year to complete this list. .so i thought i'd share what i've accomplished and what is still left. .go to another country (besides brazil). .read the scriptures from cover to cover. .be inside at least 25 temples. .be accepted into a master's program. .develop a closer relationship with my family. .take husband on a cruise or beach destination trip. .go on a church history tour. .make husband a mission scrapbook. .have 5,000 in savings just because. .help husband with his pharmacy school apps and go to pharmacy school. .make preparations for a baby. .take a road trip across the country. .spend atleast 10 days with husband in nyc (collectively or separately). .send a birthday card to everyone in our family for a year. .call my best friends more. .rid soda from my life for good. .learn when to say no. .create a project i am passionate about. and will mark off four more things from now until july. to finish them before i turn twenty-five.